Posted on October 25, 2012 by Hey! Look Behind You! 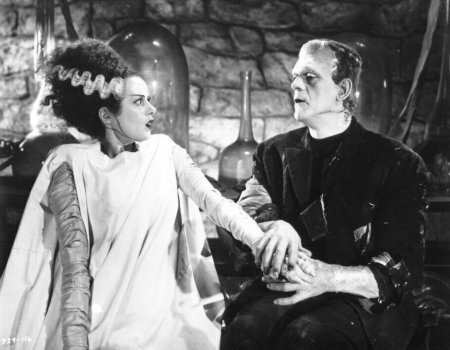 Celebrating Universal Pictures’ 100th anniversary Turner Classic Movies presented a special one day event featuring Frankenstein and Bride of Frankenstein on the big screen. It’s a huge Halloween treat for horror fans to get the chance to view these films on the big screen the way they were meant to be seen. It’s really nice this time of year to go see a classic horror film back in the day when they didn’t rely heavily on blood and gore (not that’s there’s anything wrong with that). Universal created the life of the monsters genre and I’m happy I could show my appreciation for their mark on horror films by seeing this double feature. Henry Frankenstein is a young, dedicated scientist consumed with the idea of re-creating life from a dead person. 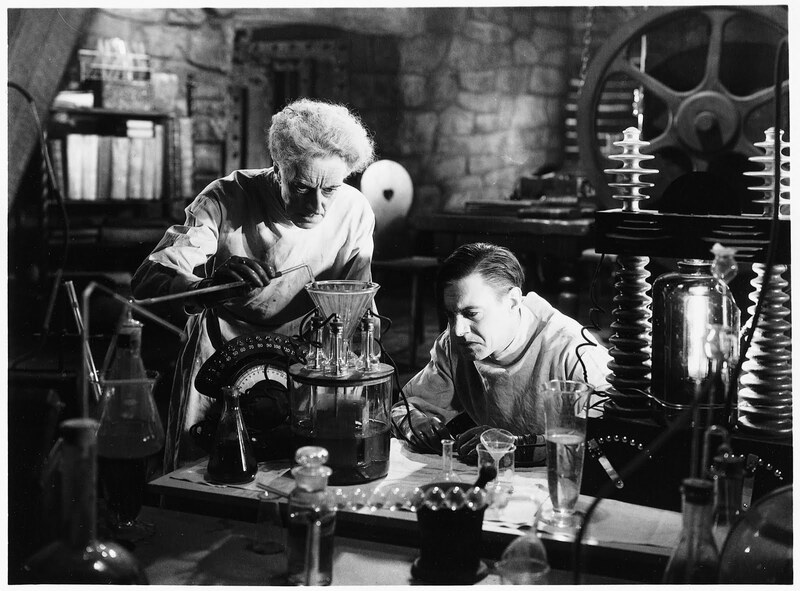 Frankenstein and his assistant Fritz stalk graves looking for fresh body parts to stitch together to form the human they plan to bring to life. When Frankenstein sends Fritz out to fetch a healthy brain, he goes to a nearby medical school. Fritz has a choice of a perfectly good, “normal” brain or the “abnormal” brain of a brutal killer. Since Fritz is clumsy and easily frazzled, he drops the normal brain and is left to take the abnormal one. Meanwhile, Henry’s fiancee Elizabeth is concerned about him being locked away with his work. Elizabeth, her friend Victor, and Henry’s former medical professor trek out to his secluded laboratory to check on him. When arriving at the lab, they discover that Henry has been toying with the desire to be a god. He wants to make a man, flesh and blood made from his own image. 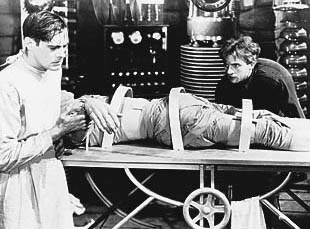 They think he’s mad but when he performs the experiment and it breaths life into the creature on his table, Frankenstein embraces a God-like complex. Frankenstein treats the monster as if it’s a pet and tries to control it but waving a flaming torch in it’s face. The monster is terrified by fire and his fearful outbursts are confused with fits of rage and violence. Frankenstein thinks the monster is unfit for society so he keeps it locked up. Frankenstein and his former professor feel like they must destroy the monster. The professor takes on the task while Frankenstein leaves to marry Elizabeth. Knowing that he’s about to be killed, the monster kills the professor and runs off into town. 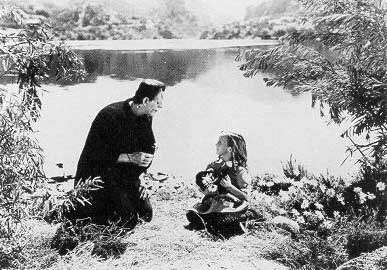 The monster has an encounter with a little girl playing by a lake. The girl doesn’t see him as a monster. She sees him as a person to play with her so she asks him to join her. She shows him her game of throwing flowers into the lake just to watch them float. She hands him flowers and together they throw them into the lake. When the monster’s flowers run out, he doesn’t know what to do so he thinks it would be a part of the game to throw the little girl in the lake. He doesn’t know that she can’t swim so she drowns. When word spreads that the monster killed the little girl and he’s loose, the town folk freak out and seek to destroy him. The monster arrives at Frankenstein’s home and attacks Elizabeth. Frankenstein takes it upon himself to track down the monster he created and destroy the life he gave to it. It is noted that the monster has a criminal, abnormal brain so it leads Frankenstein to believe that the monster was born to be evil. I think the monster is a sad creature that was awaken into a world that was never willing to accept him. Frankenstein did not factor the repercussions of playing god. He did not think about the monster as a child experiencing the world for the first time. He only saw it as a brilliant piece of work. He just wanted to prove that he can perform a seemingly impossible feat. 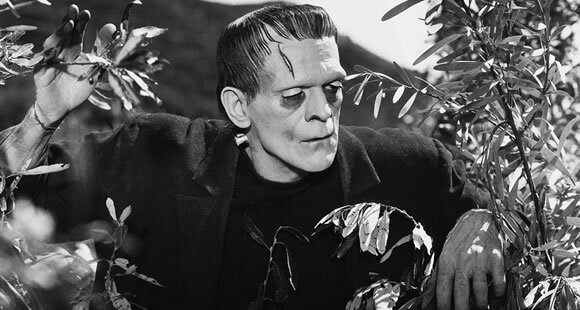 Boris Karloff brings a stunning and gentle performance as the monster. Even though he can only express himself through grunting and pleading hand gestures Karloff still gave the monster’s grotesque and frightening appearance a sympathetic nature. This follow-up film takes place right from the end of the first film. Frankenstein’s monster was assumed dead from a fire but the father of the little girl killed cannot rest until he sees the monster’s bones. When he goes digging around to look, he sees that the monster is still alive and angry. The monster flees the scene and roams around the forest in a confused and frightened daze. Meanwhile Frankenstein has returned to Elizabeth and she tells him she can see death coming for him. 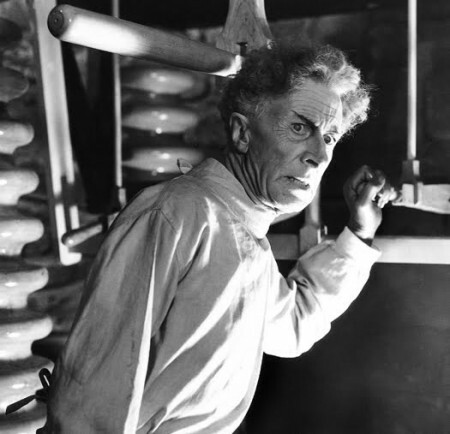 At that moment, Frankenstein’s former mentor, Dr. Pretorius shows up at his home. Pretorius is fascinated with Frankenstein’s accomplishment on creating life and wants to create a woman to complete the monster’s other half. Pretorius has a moral-less and sinister presence but Frankenstein cannot resist the sweet temptation of unlocking immortality. After a run-in with hunters and angry villagers, the monster comes across a lonely, blind old man. He takes the monster in, not knowing that he is a creature, but only caring about having a friend by his side. Over time the blind man teaches the monster how to speak and associate good things from bad things. The two take comfort in the strong friendship they have built together. Two hunters stumble across the cottage and warn the blind man that he is with a monster. They try to attack the monster but he runs away, accidentally burning down the blind man’s home. Seeking shelter again, the monster comes across Pretorius. Pretorius has been shunned by Frankenstein and is left without his help on creating a woman. 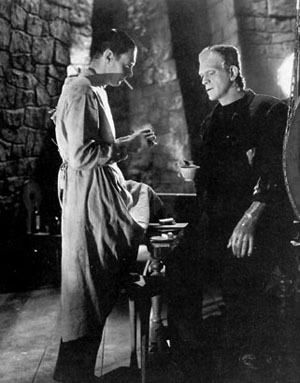 He tells the monster that he wanted to give him a lady friend but they will need to convince Frankenstein. The two go to Frankenstein’s home and the monster kidnaps Elizabeth. Pretorius tells Frankenstein if he wants Elizabeth back, he’ll have to help him bring back the body of a dead woman. 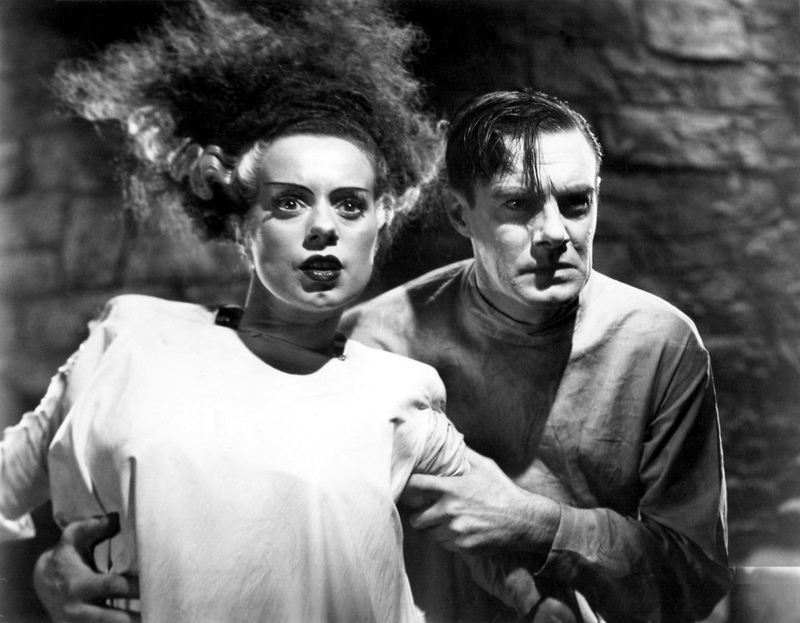 After finding a strong heart and performing the experiment, the bride of Frankenstein (‘s monster) was born. At first she seems confused about her surrounding and when the monster tries to greet her, she screams in terror. Frankenstein tries to comforts her while the monster feels rejected and hated. It hits him that no matter what, the world will never seen him as anything but a monster. Elizabeth breaks free of the men keeping her from Frankenstein and she runs by his side. The monster tells them to go and live so he can blow up the lab. The two run free and the lab is destroyed along with the monster, the bride and Pretorius. The monster’s last words were “We belong dead.” The monster knew that the life of him and his bride would have been paved by death and destruction and they were never meant to re-born. He knew that man should never play god by flirting with the creation of life from dead. Death is supposed to be the end all and eternity is should never be attainable. It was a beautiful honor to get to see these films in the theater and I hope TCM has more chances to re-release old time classic into theaters again. Saw Bride theatrically a few weeks ago and I agree – it was a great experience. It's so interesting to me how these movies spend their entire length encouraging you to sympathize with the monster only to come to the conclusion that anything that is Other must be destroyed. What a contradiction! Still – really awesome films and performances (especially Pretorius, ha! ).